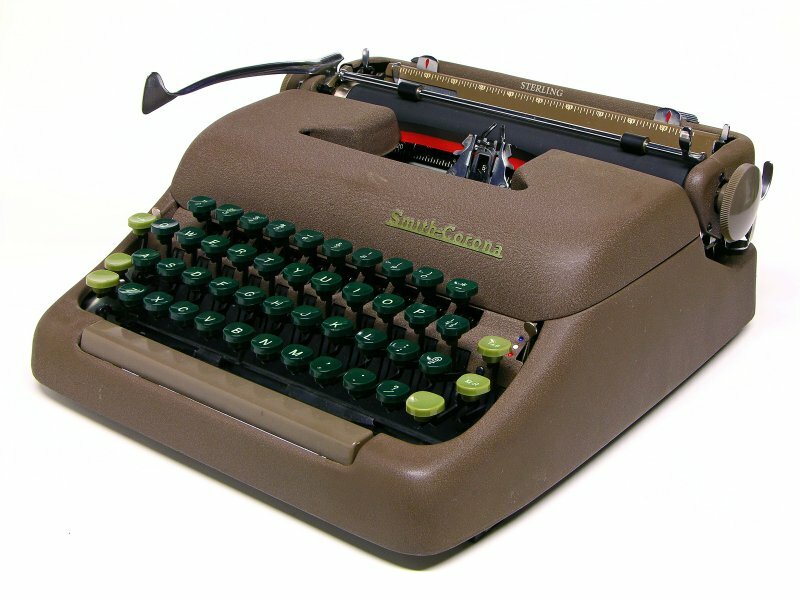 When I was first getting into the world of typewriters, my parents took me to see a movie called California Typewriter. It was mostly about a small office machine shop in California, but featured different authors, collectors, and songwriters, such as John Mayer, Tom Hanks, and Richard Polt. When asked his favorite typewriter, Tom Hanks responded with the Smith-Corona Silent. Specifically the ones from the mid-1950s with the green keys. I kept this in mind after watching the movie, and although I already owned a Corsair Deluxe, I decided it was time to go to the local antique store, Wilson’s, and look for another typewriter to buy. The next morning, my dad and I took our rusty white Subaru downtown to Wilson Antiques, and I began my search for a durable, working typewriter. I had visited the basement and the main floor of the store already when I headed up the stairs to look on the second floor. I came to a floor between the first and second that only had two small rooms, which were mostly empty, aside from a display of old coins. On a whim, I decided to enter a small room that had very little in it, besides some unremarkable furniture. I was so surprised, when on a shelf in the corner, there sat a mid-1950s Smith-Corona Silent. I called to my dad, and told him with excitement that I had in fact found Tom Hanks’s favorite typewriter. We closed the case and brought the machine downstairs, buying it for 70 dollars. To this day, the machine sits on my desk and serves as my primary typewriter. The Smith-Corona Skyriter is one of the best typewriters that I own if you are somebody who writes a lot of poems and thank you cards. It is small, portable, fits under the seat of an airline, and has a really nice touch. A Smith-Corona Skyriter comes with a handy metal case that can be used to protect and carry the typewriter. Recently, I bought an early 1950s Skyriter off of eBay. The only problem was the fact that the carrying case, the part of this machine that makes it so convenient, was missing. Thankfully, even after being stored for what seemed like years in an area where lots of dust was present, there are no big problems with the machine. The typebars are all straight, and there are no missing keys. However, the space bar wouldn’t press unless you hit it much harder than all of the other keys, and the shift key often got stuck in the down position. I took the machine to the local repair man in Traverse City Michigan over at Landmark Books, and he was able to identify the problems with the Skyriter. My ideas for the Skryiter were not completely fulfilled since the carrying case was still missing. If any of my readers are able to locate a case, I would be very grateful. Is It a Waffle Iron? On Christmas day in the year 2017, I received my first typewriter. It is a Smith-Corona Corsair Deluxe in a light baby blue. My mom had gotten it as a bit of a later gift from one of the local antique stores. On Christmas, I usually go from the smallest box and work my way up to the biggest one. So this year was the same way. When I got to the second to last gift, my parents told me to make sure not to drop it since it was quite heavy, and in a pretty good sized squarish box. Now, if you haven’t seen a Corsair Deluxe in its case, I strongly recommend you look a picture up. Also, being somebody who enjoys both making an consuming waffles, I wouldn’t be surprised if my parents had gotten me an oversized waffle iron that they ordered straight from the 1960s. A lot of Free Poetry TC is based off of the Typewriter Revolution. This is a movement that is about the integration of manual typewriters into our modern society as a way to eliminate distractions, go back to physical letters and pieces of writing, and to slow down our modern, digital lives. If you ever see anybody writing free poetry, they will most likely be using some kind of manual typewriter. I, Rowan, currently have five typewriters, and I am increasingly becoming more interested in both the history and the future of typewriters. An important aspect of typewriters is the physical piece of poetry or writing that you can actually hold in your hand and read over and over again. It will not be lost to a cluttered inbox and it isn’t as easy to “delete”. The Free Poetry Movement and the Typewriter Revolution really go hand in hand. They are both ways for us to slow down and appreciate the little joys of life, that we might have missed otherwise. If you ever see one of us in a coffee shop, or on a street corner with a “Free Poetry” or “Free Poems” sign, feel free to come over and ask us for a poem. We are happy to write one for you whether you give us a prompt or not, and we hope that you will keep your poems and come back for more sometime.